This guide is for students and educators. Entrepreneurial Mindset is a term applied to a way of thinking. It's about creativity, design thinking, and development of innovative solutions to problems. While these ideas can be applied to business development, the entrepreneurial mindset can be applied to any situation in which ideas, creativity, and a focus on stakeholder needs can be used to solve real world problems. Through a wide range of initiatives, WPI seeks to infuse that innovative spirit with an entrepreneurial mindset. There are courses and a minor in entrepreneurship and social entrepreneurship that give students the foundation they need to understand basic business principles and how to turn their ideas into viable ventures. WPI's collaborative spaces, educational programs, funding sources, student groups, and more all in one place. 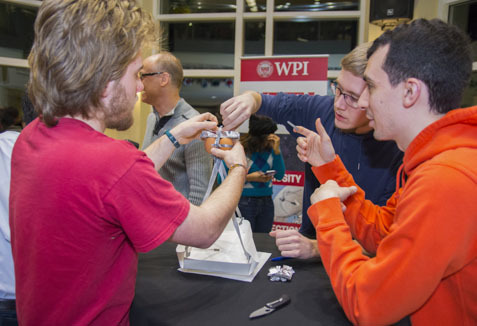 WPI’s go-to collection for knowledge of entrepreneurship, innovation and creativity. Located in Gordon Library, the books can be borrowed or used onsite. The collection is frequently updated with new books, so be sure to browse the collection located on the third floor of Gordon Library and find just the right story, advice or guidance you need to inspire your inner entrepreneur. Titles from the collection are highlighted in this guide. WPI is the recipient of a Kern Entrepreneurship Education Network (KEEN) Grant. See WPI's profile on the Kern Foundation website. Launchpad is a student-led organization fostering the entrepreneurial mindset at WPI. We're creating a culture shift on campus and empowering students to pursue non-academic student projects.